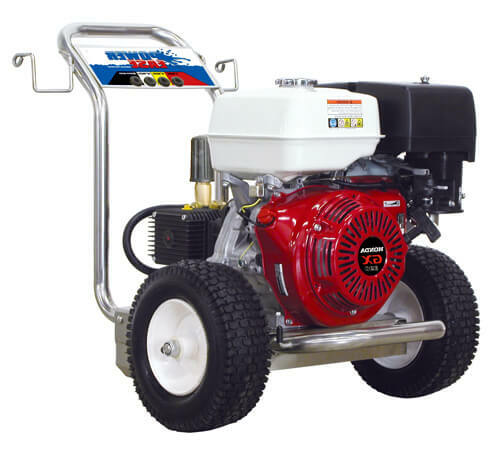 Belt drive pressure washers are equipped with Honda engine that produce up to 14,000 cleaning units. Choose among COMET, CAT or GENERAL water pumps that can generate 3,500-4000 PSI and the water flow of 3.5-4.0 GPM. The units are built on the stainless steel frame and are supported by two 13" tubed pneumatic tires. Compared to direct and gear drive pumps, belt drive pumps are designed with higher durability. Such pumps will last longer saving your budget in a long run. 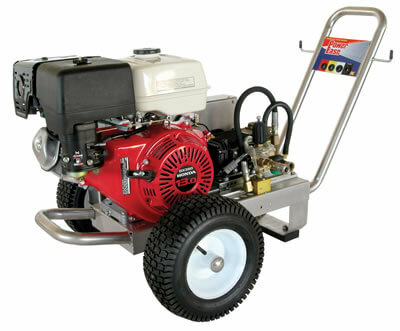 Whether your application involves low-volume pressure cleaning or heavy duty jobs, regardless of how big or small your budget, we have pressure washers, pressure washer surface cleaners, and attachments that can do the job. They are durable, safe, attractive and affordable. 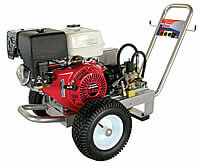 These pressure washers are great for residential, commercial, industrial, and automotive uses. Get your dirty surfaces under control with dependable washers - before mold, mildew, grime and oil stains take control over your house, building, car, machinery or potential customers go to competitor. For a long life, all pressure washers we sell are constructed of the strongest, most durable materials and components: industrial rated pump, 4000 PSI hi-rated trigger gun, stainless steel frame and Honda GX engine. The chemical injector, which comes standard with many of our pressurewashers, allows soap or chemical to be injected into the water stream making cleaning even faster and easier. EZ Start unloader eliminates pressure in the pump while starting the engine making the unit to start easier; less damaging to starter motors. High-grade power washers come with tubed, pneumatic tires instead of hard rubber or plastic tires. Tubed pneumatic tires are used for longer wear and easier maneuvering of the powerwasher on most surfaces. Additionally, pneumatic tires absorb vibration, which saves wear and tear on the working components. Wire-braid high pressure hose is rated for up to 4000 PSI. 50' of pressurehose allows an easy and uninterrupted cleaning of large area. The nozzle is the restriction at the end of the wand that creates the pressure. Nozzles have different spray patterns that can affect the width and strength of the spray. For instance, the 40-degree (white) nozzle delivers a flat spray of about 40-degrees. There's also a 25-degree (green) and the most popular 15-degree (yellow) nozzles. Caution operators about the 0-degree (red) nozzle. It can cut into wood and cause damage. 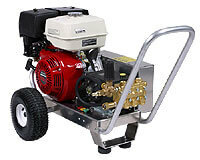 Belt driven pressure washers use pulleys and belts to slow the speed of the pump. Where the engine spins at 3,800 RPM the pump will be slowed to 1,400 RPM or 1,900 RPM depending on the pulley and belt setup. This system ensures long pump life because the bearings do not get as much wear and the pump is isolated from the heat of engine, being separated by the belts and pulleys. 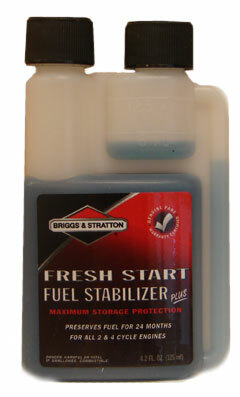 Keeps gasoline fresh up to 24 months for 2 and 4 cycle engines. Promotes quick starting - add with every tune-up. Cleans fuel system and eliminates end-of-season fuel draining. For everyday use add to gas can or directly to fuel tank. Fresh Start has a virtually unlimited shelf life as it does not contain ingredients that will decay or break down! Eliminates end of the season fuel draining. Keeps fuel fresh up to 24 months. Prevents gum and varnish formation. Cleans carburetor and fuel system. No guess, easy use pouch or no mess bottle.